Ski Regions in Carithia are something special: Calm, cosy, southern climate, Mediterranean influence in the kitchen. There is no mass tourism and no waiting time at ski lifts. There are 10 ski regions within a radius of a maximum of 45 minutes’ drive. That is what the Carinthian Uplands and East Tyrol region offers you. The starting point: the Oberdrautal (Upper Drau Valley). On this page you will find a list of all the ski regions together with a short description. If you have any questions or would like information about skiing, snowboarding, hiking in the snow, courses and other activities in winter you are very welcome to contact us. Glorious picture-book scenery, sunny slopes, tobogganing and snowshoe hikes make the Emberger Alm above Berg im Drautal an unforgettable experience. This region has four tow lifts and 13 km of ski runs, plus a wonderful panorama for extended ski tours – the top recommendation for ski courses of all kinds. From the Glocknerhof you can get here using the ski bus or your own car. Here ist the Map with all lifts and slopes. Here is the snow report of Emberger Alm. With its easy and moderate runs, this ski region is the right one for families, beginners and people who prefer their skiing on the unhurried side with no stress. So there are also attractive offers for families, a separate children’s ski world and a natural toboggan run. What makes the lake stand out is the largest area of natural ice in Austria for skating and other ice sports and a cross-country trail that bears comparison with the best in Europe. Downhill skiers, skaters and cross-country skiers will all get their money’s worth on Lake. For cross-country skiers there are 50 kilometres of double-tracked trails available and two skating trails that have been awarded the Carinthian cross-country trail quality seal. Over 2,000 hours of sunshine a year make Lienz a sunshine town and the Zettersfeld family ski region one of the most impressive sun terraces in the Alps. Stock up on strength, joy and energy in the face of the mighty Lienzer Dolomites – a pure nature experience in itself. Integrated in this environment are the 6 cable cars and lifts in the Zettersfeld, which go up to an altitude of 2,278 metres with guaranteed snow. As the ideal counterpart to the demanding slopes of the Hochstein with the Osttirodler(Alpine Roallercoaster, open in summer- and wintertime), this ski region is especially popular with families and pleasure skiers. 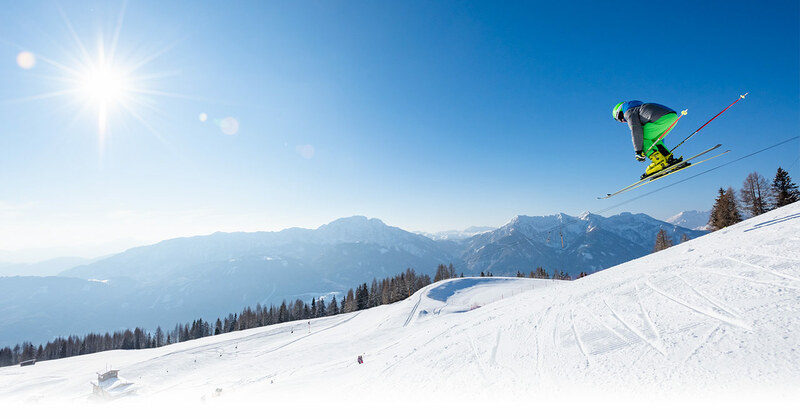 The Goldeck is a real snow park; with over 33 km of well-prepared slopes of all levels of difficulty and 8 lifts the region ensures perfect winter enjoyment. The slopes deep in snow and the 50 hectare freeride area with its outstanding panorama will make any winter sports lover’s heart beat faster. As a further highlight the Goldeck sports mountain offers the longest black run in the Alps at 8.5 km, which conquers a difference in altitude of around 1,600 metres on very challenging area. Ski tourers will find a variety of challenging and enjoyable tours around the Goldeck sports mountain. The Nassfeld is Carinthia’s largest ski region and one of the Top 10 ski regions in Austria. There are snow and sun, the most important ingredients for a successful winter holiday in Austria, in abundance here – right next to the Italian border. This region at a glance: 30 lifts, including 5 cabin railways, 4 six-seater cabin railways, 4 four-seater cabin railways and 17 tow lifts – 110 perfectly prepared kilometres of slopes: 11 km of which are difficult, 69 km moderate and 30 km easy, the longest floodlit slope in the Alps (2.2km), several freeride and fun areas, a 7.6 km long descent into the valley and the well-known reliable snow (thanks to an Adriatic low pressure zone). This region is fast to reach directly via the Tauern motorway (A10), and 70 kilometres of slopes, 16 state-of-the-art lifts and the cosiest ski chalets in the Alps. Reliable snow is guaranteed by the location on the main ridge of the Tauern and the ultramodern snow-making equipment which covers 100 percent of the slopes. You can reach St. Michael on the runs of up to 10 kilometres. The majority of the descents are considered moderately difficult, while there are ten kilometres of slopes available for beginners. Ambitious winter sports lovers will find a suitable challenge on the 10 kilometres of black slopes. Katschis Childern’s World and funpark is a popular meeting place for kids of all ages. The Mölltaler Gletscher glacier and the Ankogel are the highest skiing mountains in Carinthia and the ones with the most reliable snow. The panoramic view of around 30 three-thousand metre peaks in the Hohe Tauern from here is unrivalled. Carinthia’s only glacier ski region is open for business from September and remains open until early summer. Pleasure carvers and boarders have long ago discovered the Ankogel with its wide slopes for themselves; the national ski teams train on the “Mölli”. Waiting times for the lifts and rush hours on the slopes are unknown here. In both ski regions the typical Carinthian hospitality reigns – a good mix of unruffledness and hospitality. Every skier from beginners to professionals can have fun here on more than 20 kilometres of slopes. There are slopes of all levels of difficulty, 1 circular gondola railway (with 2 stations), 3 chairlifts and 2 tow lifts. There are also two practice tow lifts for little ones. Like all the other larger ski regions, the Hochpustertal also has snow-making equipment right down into the valley, plus a snowpark called “Yellowsnow” with corners, big straights, jumps, rails and funboxes. This ski area in the Großglockner region is the largest interconnected ski area in East Tyrol. There are no waiting times here, because the extensive ski region with over 37 kilometres of slopes offers a variety of fun for young and old. The Kals & Matrei resort on the Felbertauern is one of the most attractive regions in the Alps. This beautiful spot with its diverse mountains in the Glockner, Schober and Granatspitz groups will cast a spell on you. 17 kilometres of runs awarded the Tyrolean slope quality seal. One 6-seater cable car, one 6-setaer and one 3-seater chairlift, and 4 tow lifts. Children’s world and funpark. A ski region that is clearly laid out and where there is plenty of time for skiing, because you don’t have to stand and wait for the lifts. Skiing on perfect slopes, with lots of snow and a fabulous panorama, in nature that is still worthy of the name. In a family-friendly atmosphere where you can feel at home. This is the St. Jakob ski centre.